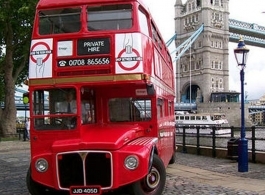 We are pleased to offer a wide choice of vintage & classic Routemaster London Buses for wedding and prom hire. Choose from double deckers, single deckers and opentop in traditional Red or Green. White ribbons are included in the price and you can choose from additional extras such as flowered decorations, balloons and personalised tickets. The most popular buses for weddings are the 72 seat Routemasters, with other buses the seating capacity can range from 20 up to 72. Please look at the images to view. We have other Buses under vehicle codes 0281.